Succession planning isn’t just for the C-suite. Imagine: what would happen to your productivity and profits if you suddenly lost just two mid-level managers? Even companies that actively plan for succession rarely address it for roles below the executive level. 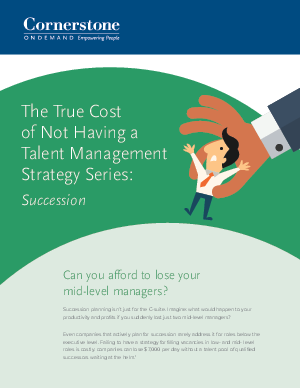 Failing to have a strategy for filling vacancies in low and mid-level roles is costly: companies can lose $7,000 per day without a talent pool of qualified successors waiting at the helm.